Bring a bit of peace and beauty into your home! If you are a nature lover and need a calming force that mesmerizes, might I suggest you turn on the captivating vistas of NatureVision TV now on Netflix. Season 3 unveils about 10 hours and 10 episodes of natural world diversity from ocean to jungle. Whether you meditate with the video and soothing music softly playing in the background or choose to mute the sound just to appreciate the awe of the bounty of creatures and places, this video collection would be great for parties and get togethers. Try using this marvelous collection just as TV art, instead of your TV just being a blank canvas. If you are a Netflix subscriber and want something unique and attractive to play throughout the day, like moving art, or just want peaceful television to wake and go to bed to, consider this wonderful collection of our planet’s gifts. I will report more, soon, on other Netflix finds, both nature-related, and not, very soon. The world is shifting faster and even more progressively to complementary medicine, than I would ever have imagined. While late-night television channel surfing, I found a program that appears to be both informative and comforting. This new show is on a channel that I rarely watch. Home to numerous reality and family related dramas, TLC is not a station that usually offers programming that thrills me. I will admit that this show really interests me. I came across a new show called, The Healer. Let me say that as a Parkinson’s patient and a reiki master, I use the term “healer” very rarely and very carefully. I had to see what TLC was doing with someone who had the ego and gift of restoring one to health. To use the word “healer” takes on a serious responsibility. Charlie, an Australian entrepreneur, has been using his “gift” for several years and seems to deliver results with varying success. Charlie admits that results may depend upon the malady and the severity of it. I respect that he takes his gift so seriously. He freely admits that some illnesses may not respond well to his energy work, while some may react better. I also like that he shares his gift at no charge. Doctors on the show are amazed, without explanation, yet appear to be willing to make the mind-shift that energy work may have merit. They are witnesses of the inexplicable. The doctors don’t deny that after Charlie’s treatment, something substantial has just occurred for their patient. Skepticism is understandable from the medical community, but when they see results from complimentary therapies, they should be willing to acknowledge them. One of the biggest dilemmas facing energy workers and the medical community is that if they both worked together, the patient may very well see surprising new results and at minimal cost. I have seen slightly over one episode so far. I am an energy worker. I find the delving and unveiling of energy work on prime time television as a huge leap in the right direction! Shows like this demystify and shed light on the benefits of touch. This television program helps to show that hands on work has much to offer. In the United States, patients are less likely to pursue energy workers. In my opinion, the reason that many doctor(s) discount or don’t understand the potential benefit of working with energy practitioners is that little to no research has been funded. Not until seven years into my diagnosis of Parkinson’s disease, at the age of 32 was I introduced to Reiki. From day one, I went from skeptic to believer, immediately. After experiencing what I had so easily discounted, it turned out to be something life-changing. Reiki hasn’t healed me to where I am void of symptoms. I do know, not scientifically, that Reiki has made my life considerably better, increased my quality of life, and slowed my Parkinson’s progression over these last 20 years! 10) Intake Matters – Consider everything that you put into your body. Stay hydrated! Eat as cleanly as you can (local organic fresh vegetables, balanced diet, pay attention to your nutrition) and going easy on processed foods. Try reducing and even eliminating soft drinks. Avoid artificial sweeteners! 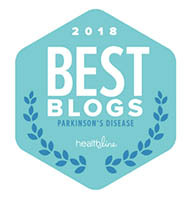 Diet and Parkinson’s disease seem to go together; which makes complete sense, as reams of research seem to point to the gut as a possible culprit for the illness. Since going vegetarian, by vastly reducing my soft drink intake, increasing my water consumption, and reducing my reliance on processed foods, I have noticed digestion and medication absorption both, seem to have improved. 9) Keeping Social and Well – Informed – Creating and maintaining a social life keeps you involved, knowledgeable, engaged, and active. A social network and/or a support group is an opportunity to connect with other like-minded individuals who are dealing with your condition. Sharing information together provides you with a resource for experience and wisdom from those who are living with illness as well as those who are caring for loved ones. Having a sounding-board of experienced people can be very helpful when trying to learn about medications, navigate local resources, find therapies, and share stories about your health care providers. Seek support! 8) Lowering Your Stress Level and Keeping Anxiety Down – There are techniques and complementary therapies like massage, yoga, meditation, Reiki, and Tai chi, which can reduce stress anxiety, and calm the mind; these are but a few of the many therapies that you might consider trying. Several of these therapies can help teach breathing techniques and ways to lower anxiety. Finding that balance of your mind, body, and spirit can have a significant impact on your health. 7) Special Doctor – If you have Parkinson’s disease or another kind of movement disorder, find a neurologist who is specially trained as a Movement Disorder Specialist. They have extra training and an understanding in neurological disorders. 6) Keeping Positive – A positive attitude is contagious. Making the choice of staying positive and identifying the good instead of the negative is important to create a healthy and conducive environment. Remember that you have a choice! 5) Gratitude – Hold on to your joy for life and the gratitude for all that is in your life! Appreciate what may seem like small things but really are not, is a good start. Medicine, doctors, clean water and air, a good meal, friends, family, and just being alive are all to be appreciated. Add the awe of a sunrise, a sunset, a good laugh, great conversation, and helping someone else, are all acts to be cherished. 4) Doing What You Can – Do as much as you can, while you can, and maximize your good days! Take advantage of everyday and make the most of them! 3) Be Heard – Get involved in your community through advocacy groups, local organizations, and share your voice about your journey with illness. Educate those around you about your illness and encourage friends and family to learn with you on how to improve the Parkinson’s community. 2) Do Something – If you are in denial, apathetic, or depressed, it may be very difficult to motivate yourself to do what you need to do. It may be helpful to seek help from a counselor or someone who understands depression. This may take small victories and small steps. It may take learning about the disease in small chunks. Know this, that everyone’s journey is different and that you can’t gauge one patient by another. The more proactive and motivated you are, the more prepared you will be. Being flexible and staying open to new opportunities can be very helpful. 1) You are Not Powerless – Realize that you are in the driver’s seat to your healthcare! You must be your own best advocate and make sure that you are doing your very best. Be proactive with conventional medicine, skeptical but open to other non-invasive therapies, and a willingness for change. A little hope and faith can go a long way! I really do believe that we have the power to help ourselves. We have the power locked inside ourselves, we just need the right key to unlock it. I think it is up to us to find that key. Living with an illness is a constant reminder that every day is precious and full of meaning. Signs and opportunities present themselves, if you stay aware to recognize these opportunities. Here’s a recent example about a small gesture that made a big difference in someone’s life, as well as my my own. A doctor friend in Ohio had asked us to teach him reiki. We don’t normally drive a few hundred miles across the country to teach one person reiki , but this was an experiment that we needed to try. When first arriving into town, we checked into our hotel and found a place for a late dinner. The restaurant, a college bar and pizza hangout, was lively and rocking. Our waitress was very friendly, hard working, personable young lady. When the bill came, and it was time to pay, I felt compelled to reward her for her service and her hard work. I paid the bill at the table and slipped out to the parking lot to get back to our hotel around the corner. Just as we were about to get into our vehicle, we saw our waitress darting out of the restaurant, bolting towards our car. She had a huge smile and was beaming from ear to ear. Quickly, the young lady, began to tear up as she told us of how her rent money had been stolen from a break in to her car. She said that her rent was due and that the tip that we had left her was going to make a difference. You could see it in her face how appreciative she was. For what I thought was just a kindly gesture and recognition of someone doing a great job, meant so much more to her. What we perceive as one thing can be very different to someone else. I didn’t set out to make an impact on another, but I did. I received so much more from her story than I could have imagined. Something that seemed so small at the time touched another and left a impact that I would have never expected. I feel so lucky to have had this experience. I hope you too will try this experiment in rewarding and acknowledging those people who you encounter either with a kind word, an act, a smile, a gift, or a gesture. It is so important to recognize those around us and show our gratitude. Seeking peace and serenity can only add to your health. The more that we know about what brings us peace and calmness, the closer we are to finding balance. Taking the mystery out of a reiki treatment. The time has come to demystify the word reiki (ray-key). “Rei” means light and “ki” or “chi” means energy. Many of you who follow my blog, know how important this complementary therapy/energy treatment is to me and just how it has changed my life for the better. Just this weekend, friends who have known me for over 15 years, were amazed to see me bring a halt to my dyskinesia just by using the practice of reiki. One dear friend, who was in agonizing back pain, came to my wife and I for a treatment in hope of some relief, to which she got. Reiki doesn’t do everything you need and it isn’t a cure—it is one more tool in your toolbox. We are all unique and the code that works for me may not register for you, but isn’t it worth investigating? Everyone can use one more tool! Reiki is a practice with ancient roots. The reiki method/protocol I use was developed in Japan over a hundred years ago. The reiki that I practice comes out of a lineage call Jin Kei Do which combines a practice of Qi gong, meditation, and the use of touch to transfer universal energy. Reiki can be effective for: balancing one’s personal energy, reducing fatigue, lowering anxiety, helping to get a better night of sleep, reducing pain, and a assisting a variety of other challenges. The practice is performed by nurses and some doctors in over 100 hospitals in the United States. Slowly, this treatment is gaining the credit that it deserves. How is a reiki session performed? A reiki treatment or session is very simple. The client, unlike a massage, remains fully clothed and either sits in a chair or lies on a massage table on their back while the practitioner lightly touches or even works inches off of the body. The client does remove their belt, shoes, and eyeglasses and gets on the table or chair and is asked to relax and to just breathe. The practitioner very gently and lightly touches the head, chest, stomach region, legs, back, and feet. The client may feel heat, cold, tingling, or nothing at all. Often, like my first time with reiki, I fell asleep on the table, for over an hour and woke up feeling much better and more refreshed than when the session began–that is what started it for me almost 20 years ago. That is why I decided to learn reiki for myself. I was skeptical, until I actually experienced it. Once the session is over, the client is gently awoken, given a drink of water, and sent home. Benefits may last weeks until the next treatment. Sessions can last as long as 1.5 hours or as short as 15 minutes and usually are about the price of a massage. The beauty of a level 1 reiki class is that it is all about self care, so you can learn to perform reiki on yourself, whenever you choose. If you decide you want a better understanding of this energy treatment there is level 2,3, and mastership, which in my lineage is a 1 year training program. I suggest going to your practitioner/teacher to receive the benefits of their treatments and to experience it before, you commit to learning it yourself. The reason I decided to become a reiki master is that I saw the benefit of reiki help my Parkinson’s so I wanted to teach reiki to others with Parkinson’s. In order to be able to teach reiki, one must become a reiki master (in our lineage). 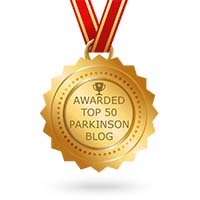 Combined, my wife and I have worked on at least 100 people with Parkinson’s disease and their carepartners. We have seen benefit from these treatments, even when they sometimes can’t see the results themselves. The first thing we notice is a clarity in their eyes, sometimes an improvement in clarity of mind, better mobility and flexibility, or just a release of tension and anxiety. I also have seen smiles and a softening of the face muscles. In 2013, at the World Parkinson Congress (WPC) in Montreal 2013, I had the privilege to work on 9 people with PD, and 8 of 9 expressed a benefit from the treatment. I even saw an improvement in the person who didn’t see a difference. They were more relaxed and appeared more refreshed after the treatment. Some people don’t verbalize their experiences with reiki as fully or clearly due to this new sensation. My wife, Angela, a reiki master, as well as many other experienced reiki masters, massage therapists, yoga teachers, and I plan to work at WPC 2016 in Portland, Oregon at the Wellness Way area of the conference. Wellness Way is an area where you can experience therapies or just take a quiet respite and enjoy a moment or more for yourself. I encourage you to explore reiki and other such therapies to see if they might assist you along your journey as you look for relief from stress, anxiety, or fatigue. I encourage you to find a referral for a reiki practitioner near you to offer you a free sample or trial period to see if you like it. Please make sure that they are experienced, sensitive and aware about your condition. It’s been a long, cold winter and I’m coming out of hibernation. I promise to start posting more as the days grow warmer. 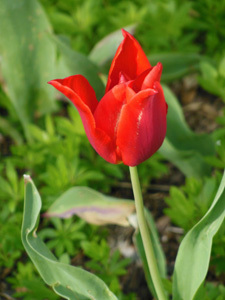 I want to share with you this picture of the first tulip to arrive in my garden. April is Parkinson’s Awareness Month so, I urge you to learn about Parkinson’s disease (if you don’t know about Parkinson’s), teach (educate others about Parkinson’s), or help (if you can volunteer or donate) to any of your favorite Parkinson’s charities! If you are unable to be live on the call, you can submit your questions ahead of time by visiting the weblink and then listen to the recording for your question. 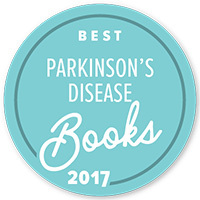 I will be speaking and signing books at the Parkinson’s Disease Education & Support group at the PADRECC in Richmond, VA on April 24 1-3pm EDT. Click here to see the flyer for the event. On April 26, I will be speaking at the Spring Education Forum of the Parkinson’s Wellness Chapter in Mason, OH. I will be speaking in the morning and afternoon. I will also have books for sale and will be signing books. If you would like more information on this event and to register, visit this website to register. I hope you can join me today for this exciting event!